A macular hole is a disorder in which the center portion of the retina, which is called the macula, develops a hole or a break. The macula is the portion of the retina that is responsible for a person’s ability to read fine print, to drive and to do other detailed work. When a hole develops in this area it results in a reduction in one’s central vision, which can be mild to severe depending on how large the hole is and how long it has been present. Macular holes go through four different stages. In early stages (stage 1 and 2) patients may notice only a slight distortion or haziness in their vision. Lines may look bent or crooked and in later stages (Stage 3 and 4) central vision is blurred and detailed vision can be lost. Macular holes can best be seen on a cross sectional image of the retina which can be obtained using Optical Coherence Tomography. 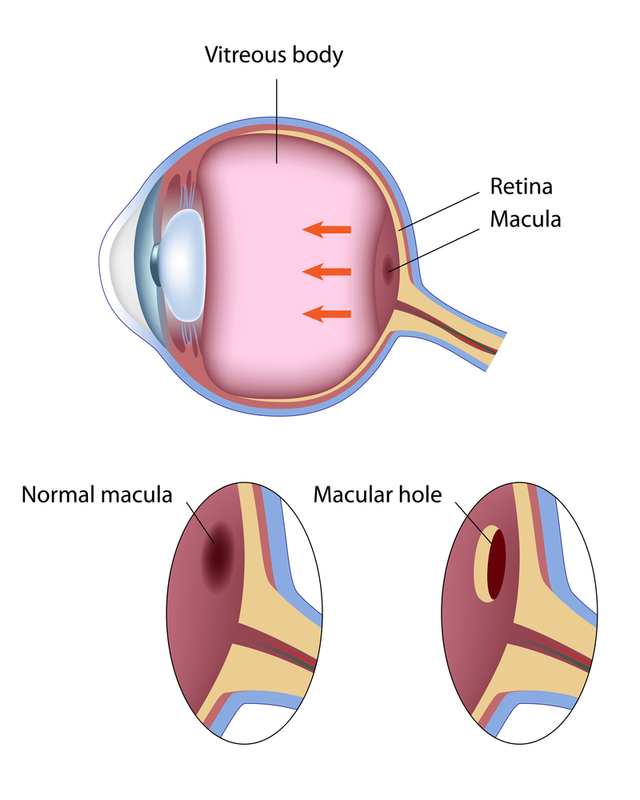 A normal retina appears in image 1, whereas a macular hole can be seen in image 2. Macular holes are seen usually in people over age of 60 without any other eye diseases. However, macular holes can be associated to eye disorders such as nearsightedness (high myopia), macular pucker, trauma, diabetes and retinal detachments. Usually macular hole affects only one eye, but in up-to 15 percent of time the other eye maybe affected. Only a small percentage of stage 2, 3, and 4 macular holes can heal on their own, the majority will need surgery to improve vision. Surgery is often on an out-patient basis with local anesthesia. In general, once you have a stage 2, 3, or 4 macular hole, you are better off having surgery within four to six weeks. Typically, the longer you wait the less likely you are to get you vision back. Visual recovery for macular holes that are over a year old tends to be less than those that are only a few weeks old. Macular hole surgery involves removing the material in the center of the eye called the vitreous gel. In most cases the tissue on the surface of the retina called the internal limiting membrane and other associated membranes are also removed. The gel is then replaced by a gas bubble. The gas bubble presses against the retina/macula and helps to close the macular hole. During surgery a gas bubble is typically used, which can last around 2 or 10 weeks depending on the type of gas used. Face down positioning is no longer required in all patients after surgery, but in some cases your physician may request this to improve the chance of success. When needed it is typically only for a few hours a day, and at night patients can usually sleep on their side. While the gas bubble is in your eye, you will be instructed not to fly as the bubble can expand and cause eye pressure elevation, glaucoma, pain and vision loss. If you or someone you know has a macular hole, it is best to see a doctor promptly and to have it treated within a few weeks to insure you get as much vision back as possible.